Shares soar in response to the release of positive clinical updates. In response to the medical device company reporting numerous positive clinical trials updates, shares of NovoCure (NASDAQ:NVCR) rose by 57% as of 12:15 p.m. EDT on Monday. NovoCure gave a series of clinical updates that got the markets excited. First, the company reported data from its phase 2 Panova study. This trial was testing the combination of NovoCure's Optune device plus standard-of-care chemotherapies for treating advanced pancreatic cancer compared to chemotherapy alone. The Panova trial showed that adding Optune to currently available treatments more than doubled progression-free survival and one-year survival rate. The data was strong enough for the company to green-light a phase 3 trial. Next, NovoCure presented interim data from its Stellar trial, which is also studying Optune in combination with standard chemotherapy as a potential treatment for malignant mesothelioma. The one-year survival data was 50% greater in patients who used Optune and chemotherapy when compared to historical control data. The Stellar trial remains ongoing and the last patient was recently enrolled. After that, NovoCure reported data from its phase 2 Innovate trial. This study was testing Optune's use in combination with paclitaxel as a potential treatment for recurrent ovarian cancer. The data showed that progression-free survival for the combination therapy was more than double that of historical data. Planning for a phase 3 study is currently underway. Finally, NovoCure announced data from its long-term EF-14 trial as well. This 695-patient study was designed to test the long-term outcomes of using Optune in combination with temozolomide chemotherapy for the treatment of newly diagnosed glioblastoma, a type of brain cancer. Data from the EF-14 trial showed that adding Optune to the standard-of-care chemotherapy treatment led to improvements in overall survival rates at two, three, four, and five years. In total, the Optune device increased the overall survival rate in newly diagnosed glioblastoma patients from 15 months to 21 months, a statistically significant gain. More specifically, patients who used Optune and chemotherapy demonstrated a two-year survival rate of 43%. That compares quite favorably to the 30% rate observed in the group that only received chemotherapy. The five-year survival data also favored the Optune/chemotherapy combination, leading to a statistically significant 13% survival rate compared to a 5% rate for chemotherapy alone. Dr. Roger Stupp, EF-14's principal investigator, offered up a lot of positive commentary for Optune in the press release. He said, "I believe this trial establishes an entirely different approach to cancer treatment with minimal toxicity which may be well suited for combination with conventional treatments for many other cancer types." Given the slew of terrific clinical data, it is easy to understand why shares of NovoCure are soaring today. 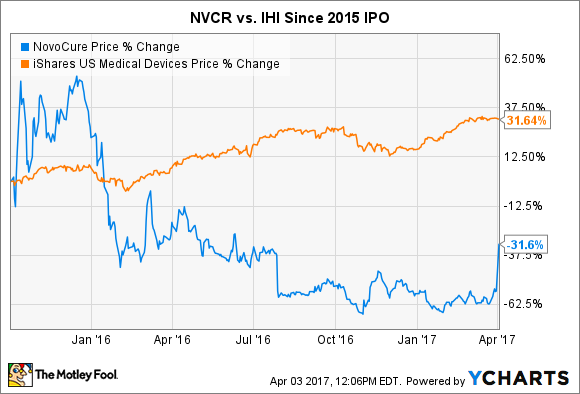 While NovoCure has consistently posted triple-digit top-line growth over the last few quarters, its stock has been a dreadful long-term performer. In fact, it has badly trailed the medical device industry in general as measured by the iShares US Medical Devices ETF (NYSEMKT:IHI) since its October 2015 IPO. Thankfully, the data from all of these clinical trials suggest that Optune holds the potential to have a transformative impact on the way that we treat numerous types of cancers. Given that tens of thousands of patients die from ovarian, pancreatic, solid tumor, and brain cancer each year in the U.S. alone, the potential growth runway for Optune continues to look massive. For perspective, only 1,091 patients worldwide were actively using Optune as of the end of 2016. Looking ahead, the uplifting data from the EF-14 trial should make it easier for the company to convince providers, patients, and insurers to use and cover Optune. That would allow the company's torrid top-line growth rate to continue. Meanwhile, the data from the Panova, Stellar, and Innovate trials suggest that NovoCure's plans to expand Optune's labeling to other types of cancer could also work out. If true, then it is possible that today's big jump could just be the start of a profitable long-term run.